Is there anything more magical, more Christmas-y, than Santa Claus hopping from rooftop to rooftop in the beautiful Parisian night, the Eiffel Tower lighting the sky as the jolly old man enters an apartment and… robs it? Santa Claus (the film that is, not the man) is not your usual Christmas film. Sure, it’s filled with decorated trees, paper wrapped gifts, snow and that good old Christmas spirit, but the plot is neither about saving Christmas, proving Santa Claus exists, making two people fall in love, or saving Christmas by proving Santa Claus exists so that two people can fall in love. Here, the titular Santa is actually a regular man who found the best trick there is: disguising himself as a bearer of gifts, entering people’s apartments he knows are empty on Christmas Eve, and stealing some precious jewels he can easily hide in his basket. Fresh out of prison, the thief (who is never named) is actually working for a gang he owes a debt to, but hopes this will be paid once the night is over. Everything might not go exactly as planned, however, once he lands on the balcony of Antoine, a clingy child who wholeheartedly believes that the man facing him is the real Santa Claus. The kid is determined to follow him around, and the fake Santa quickly discovers how useful a small and agile child can be when it comes to breaking and entering. 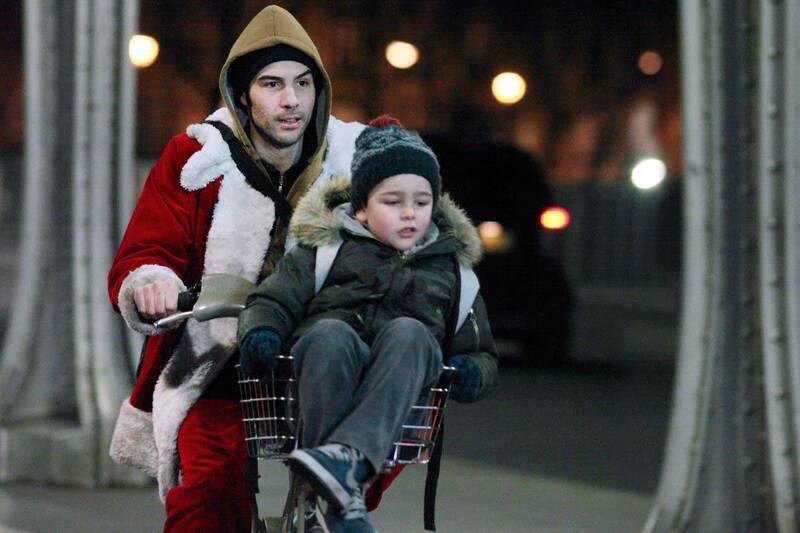 "This remake of ET seems a bit, cheap" - Tahar Rahim and Victor Cabal in Santa Claus! What starts off as a humorous and slightly malicious relationship soon becomes the heart of the film as the fake Santa pretends to be a real one and plays along the kid’s fantasy while starting to feel a real change within himself. The charisma of Tahar Rahim (“A Prophet”, “The Past”) instantly makes the thief likeable despite his shortcomings, and first-time actor Victor Cabal plays his part perfectly. His sad, adorable face wins us over from the very start, but the young boy genuinely shows talent and, most noteworthy, acts and talks like a real child all along. The pair’s journey takes some twists and turns, but it is always the characters’ development and relationship that takes precedence over all the rest. Thanks to this, the tone is never one-note: the emotional core of the film – Antoine is mourning his father – is handled with a lot of heart and balances well with the lively robbing montages set to catchy songs such as James Blunt’s Bonfire Heart and MC Hammer’s U Can’t Touch This; so be prepared to laugh and cry and laugh some more, all the while admiring the magnificent shots of the Parisian rooftops and lit-up streets. While still keeping the wholesomeness of the genre, Alexandre Coffre (“Borderline”, “Spirou & Fantasio’s Big Adventures”) managed to create a film that avoids the usual storylines and has enough depth to be watched any time of the year. So don’t hesitate to put Santa Claus in your Christmas watchlist, and if you don’t find the time this December, remember that it’s never too late to watch it once Christmas is over and you’re still longing for a good story and well-made film! Click here to read this review in French.